New and Full Moons are great times to create ritual. They give us an emotional reference point on which to base that ritual. For instance, this upcoming New Moon in Libra can facilitate a focus on expanding relationship, finding common ground and pursuing personal integrity no matter the cost. So, what kind of ritual? Well, ritual is anything that you choose it to be. It does not have to be fancy or complicated, surrounded by pretentious and often incomprehensible actions. Rather, it should be something that is meaningful to YOU, something that enhances your own personal connection to whatever you have designated as the ‘divine’. It could involve movement like dancing or rhythmic walking, singing, chanting, eating drinking or any other human activity that can transport you into a reverent and open-minded state. Of course, the more that the ritual is aligned to the energy of the moment, the more powerful it becomes. With this New Moon, the focus of the transiting energy is on the ‘beauty that is spiritual hunger’. It is about opening the higher chakras to an influx of divine energy and then searching for a way to enact that energy in practical healing and humble ways. And truth. This lunation is about ‘truth’. Find your truth, bring that truth into the core of your being and hold on fast to that truth. And possibly, be prepared to discover new and unique ways to concretize your truth in your life. 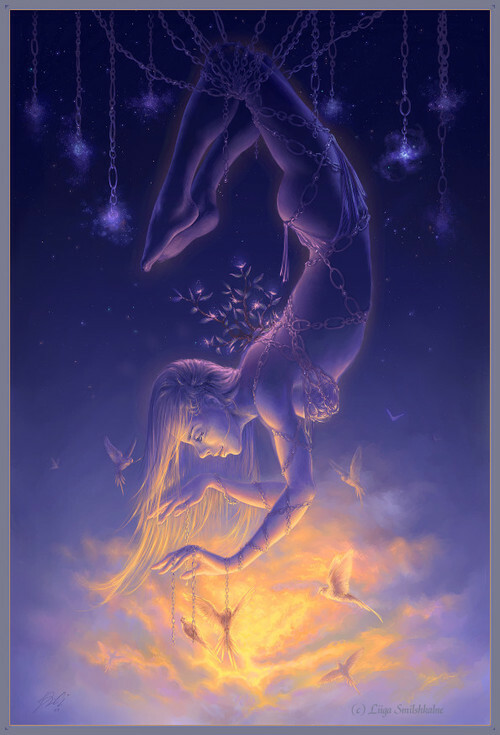 Jupiter has newly shifted into Scorpio, the energy that knows no limits to truth-telling and with a Mercury, also newly entered into Scorpio, he conjoins the Sun/Moon in Libra infusing this lovely Libran energy with a steely vitality that fortifies under the surface. Jupiter in Scorpio is a hungry energy that demands response for its efforts so the soft Libra New Moon floats into the room on a hidden torpedo. Yes, its about peace and beauty but with a sense that this is one area that is non-negotiable. Let’s get this done, says Jupiter in Scorpio and I’ve brought along my little helper, Mercury in Scorpio to be sure that it will. He has strategies galore! Uranus is exactly opposed to the new Moon suggesting forces that are beyond our control and which might appear suddenly without warning. If you have been doing your karmic work, TRUST THE PROCESS and believe in the power of goodness. Saturn in Sag trines this fierce Uranus and sextiles the Sun/Moon, a promise that if diligent effort is applied, positive results will follow. Remember, Trines and sextiles suggest ‘earned’ benefit unlike squares which demand effort and energy. Saturn in Sag, in this lunation, is ruled by that hungry for truth Jupiter in Scorpio so we have double emphasis on truth-telling, truth-speaking and truth seeking. Follow your hungry heart and create the reality that best reflects your commitment to your truth. Oftentimes, it is only through detachment from personal agenda that we can actually get to a place of cohesive purpose. Libra energy emphasizes that in the final analysis, the path to peace includes some degree of compromise. If we can actually cultivate objectivity when working with others, we stand to gain far greater success than if we hang on to subjective viewpoints. But it’s hard. Most of us have arrived at our points of view after multiples experiences that have underlined the way that we see the world. The first symbol encourages us all to draw back into a place of wide vision, to get the whole picture and not just a tiny part of it into our consciousness. Use the power of peace (Libra) to calmly confront whatever issue is facing you, to look disagreement in the eye and find a way to understand where that disagreement is coming from. Reconcile. Re-affirm. Renew your faith in dialogue and co-operative counsel. The second symbol promises that this, in fact, can happen. We can turn discord into unity. We can create community out of chaos if only we can truly visualize such unity and then take steps to make it happen. A ‘lost opportunity’ is only lost if we do not find it. Our job is to keep looking for a way to “GIVE PEACE A CHANCE”! 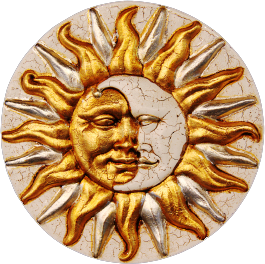 When the Sun and Moon face off zodiacally, exactly opposite each other in degrees, we call it a FULL MOON. This particular Full Moon is loaded with fiery energy and squaring off with the force within that represents transformation or at the very least some cataclysmic kind of shift that could lead to transformation, (Pluto). The Libra Sun draws our attention to the relationship part of our life and with a very tight conjunction between Venus & Mars in Virgo, we might find ourselves questioning the practical benefits of any relationship that we might be in. Is it still useful to our growth and development? Does it still serve our deepest emotional needs? Does that partner still resemble some aspect of the thing that drew us to him or her? These dual archetypes that represent value and action are in active contact with a prominent (in the context of the event chart) Saturn in Sag. We might find ourselves feeling a sense of determination and resolution to follow our natural impulse when it comes to getting to the bottom of these questions. Sag is all about the real truth and nothing but the truth so when this energy is highlighted, it is our job to FACE THE TRUTH and especially so with Saturn in Sag. Remember, Full Moons can provide perspective and illuminate any given situation if we let them. That is not to say that every Full Moon will provide you with an ‘aha’ moment. That really depends on YOU and whether you are ready to have that ‘aha’ moment. But the potential is present, for sure. So, allow your intuitive side to kick in, Neptune/Pallas in a YOD to the Sun/Moon. Neptune, at the highest possible vibratory level, is spirit descended into the heart and mind (crown and ajna chakra), while Pallas represents that part of the mind that is supremely and even mystically intellectual. When joined in this way, an almost exact sextile and both almost exactly inconjunct the Sun/Moon (the YOD), we have a set-up that could produce sudden insights and inspirations. These ideas, often elusive, can then be implemented to forward whatever practical (Mars in Virgo) strategies are needed to concretize the nebulous. That is how these energies can be made useful. On its own, Neptunian impulse can sometimes dissolve into a sea of nothing but bolstered with more down to earth energies, that singular idea can take form and blossom into something substantial. So, dream away and then do it. And certainly, take those rose coloured glasses off. All they do is obscure the truth of anything you are looking at. Jupiter is just about ready to dive into Scorpio. Get ready for a year of focus and drive like none other. When Jupiter transits this powerful energy, the need for success takes a prominent place within the psyche. Complete those projects. Allow the drive to be the best fuel you to refine your skills. There is absolutely nothing wrong with accomplishment. For all of you who are born under the sign of Scorpio, this is your year to receive. What you receive will be exactly commensurate with what you have invested. That is the real law of karma. Nevertheless, I do rather like the transit of Jupiter to the Sun, Moon or ascendant. The energy is so irrepressible and does not take NO for an answer. So, enjoy it while it lasts. Just remember to get some sleep when you can! Jupiter in the Full Moon chart is pretty much in exact opposition to Uranus in Aries indicating the surprise element in any goals that we might set. Expect the unexpected, as they say! Resourcefulness is the keyword. Yes, bombs do blow things up but contained in this symbol is the sense that disaster CAN be averted, be that disaster literal or figurative. A bomb can fail on its own but more importantly, we can develop and refine skills that can diffuse whatever ‘bomb’ might fall across our path. Be a solver of problems rather than a victim to circumstance. There are no perfect pathways. There are always ‘oopsies’. If you are not a ‘natural’ problem solver, that does not mean that you do not have the ability to develop problem-solving skills. Often, the solution to any impasse can be found deep within the impasse itself. Strange but true. So, go ahead and confront those problems, tackle those impossibilities and conquer the world. The second symbol demonstrates that often, it is during so-called ‘play’ that the mind finds the way out! Childlike imagination can provide us out of the box solutions to long-standing issues. Often, it is the most obvious pathway that takes us to the exit point of a seemingly insurmountable situation. Simple is best even though sometimes it seems most complicated. Day-dreaming, suggested by the pastime of ‘blowing bubbles’ can lead to incredible insights. The mind never stops working so even when YOU think that you are wasting time, don’t kid yourself. You might be, but your mind (and your heart) are busy at work. Sleep is regenerative and so is taking a break. If that impasse in your life just feels too large to overcome, take that break. Give it a rest. Let your trusty higher self do the work. You will not be let down. I promise. Of course, you do have to be obedient to what the higher self reveals. He puts off the lie imposed by others on him. Stripped, naked, natural, he is what he is.